Dr. Suresh Chari is a professor of medicine and a consultant in the Division of Gastroenterology and Hepatology at the Mayo Clinic (Rochester, Minnesota). He has been the director of the Pancreas Clinic at the Mayo Clinic, a councilor and a past president of the American Pancreatic Association, and a councilor of the International Association of Pan¬creatology, of which he is now president. His NIH-funded research has focused on new-onset diabetes as an early marker of pancreatic cancer, and he is currently the principal investigator of the EXPAND trial, the first prospective screening study for sporadic pancreatic cancer in subjects with new-onset dia¬betes. He is also leading the national NIH Consortium to assemble a cohort of 10,000 subjects with new-onset diabetes. His clinical research has covered a complete range of pancreatic diseases, including tropical chronic pancreatitis, autoimmune pancreatitis, pancreatic cancer, and cystic tumors of the pancreas. 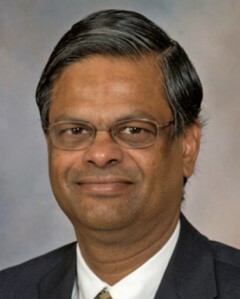 Dr. Chari trained in internal medicine and gastroenterology in India, then held an Alexander von Humboldt Fellowship in research in Germany, and, after moving to the United States, completed a gastroenterology residency at the University of Arizona and a gastroenterology fellowship at the Mayo Clinic.